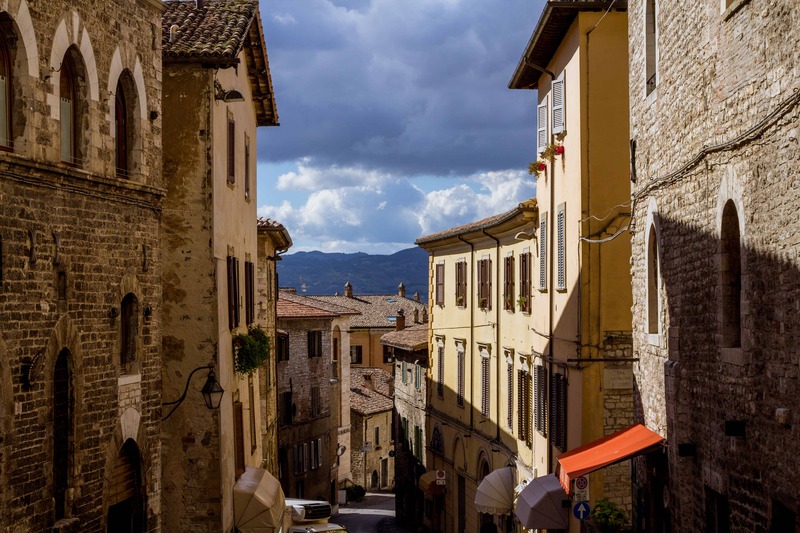 If you’re planning a trip to the region of Umbria in Italy, add Gubbio to your list of day trips. For a week in October 2017, my husband and I stayed at le Torri di Bagnara in the region of Umbria, Italy, for our destination wedding. Twenty of our closest friends and family stayed at the villa with us, giving everyone a chance to explore Italy. Since we had to meet with the wedding planner early in the week, we chose Gubbio as our first day trip. It was a 20 minute drive from the villa and we figured we could see everything in town before dinner. We went with three of our guests, and though we arrived when most things were closed, we still had a wonderful time walking the streets of the beautiful town. Sitting high above Gubbio is a small basilica built over an existing 14th century church. This shrine protects the preserved remains of St. Ubaldo. Also stored inside the church are the Three Ceri used in the Corsa dei Ceri festival every may (see below for more info). The church is closed on Mondays from 12:30 until 3:00 PM, which we discovered when we arrived at 12:40 PM on a Monday. Photo Tip: Walk down the road until you reach a make-shift scenic overlook to get views of the valley below. No one puts the Fun in Funicular like Gubbio. The cable car takes visitors and citizens visiting St. Ubaldo to the top of Mount Ingino. The cable car was installed and ran for the first time in 1960. Not much has changed from the first design. It’s still a small cage that carries one or two people up the slope of the mountain. Similar to a ski lift, the cars do not stop as passengers get in. You have to hop in and hop off. To get to the cable car, you’ll head towards Via San Girolamo. There are maps of main attractions in Gubbio around town, so these should help you locate it as well. Hours of operation vary depending on the time of year you visit. Check out their website (have to use Google translate for English) to find out more. It’s only a few Euros per person for a round trip. Do you like my husband’s sunglasses? Check out the affiliate links below! If you visit during Christmas season, the hillside is transformed into a Christmas tree with lights covering the mountainside. You can travel along the large Christmas tree in the funicular. The Duomo was built during the 13th century, above a former Romanesque church. The inside of the Cathedral is beautifully painted, similar to the cathedral found in Assisi, with ceilings painted like the night sky and frescoes covering the walls. There is also a late Roman sarcophagus under the high altar containing the remains of San Giacomo and San Mariano. The Dumo is located across from a museum, the Museo di Palazzo Ducale. The Palace was built around 1476, in Renaissance form, by order of Federico di Montefeltro. Inside is a large courtyard, once used by as the town hall square. As part of the museum, you can explore some of the rooms of the palace and see different exhibitions, including archaeological finds from the area. Not only was everything closed when we arrived in Gubbio, there was construction outside the Duomo’s entrance. We made it inside a building eventually, though. The Piazza is located along Via dei Consoli, and overlooks half of the town. The palace was built between 1332 and 1338 on one side of the large sqaure. There is a 2 ton bell dating back to 1769 hanging in the bell tower (The Big Bell or “Il Campanone” was rung by the bell-ringers’ feet). Inside this public hall is now the Municipal Museum (or Civic Museum). The most notable items on display are the Iguvine (Eugubian) Tablets, discovered in 1444. Iguvium is the name of the town during medieval times. These 7 bronze tablets constitute the largest surviving text in the Umbrian language, a language from pre-Roman times, and offer ritual directions for particular ceremonies of the Atiedian Brethren, a group of priests. Like the Basillica dei Sant’Ubaldo, the Museum was closed between 12:30 and 3:00 PM. We decided not to wait around to go inside. Some of our other wedding guests visited Gubbio later in the week and went inside to see the Torture exhibit. When walking towards the Duomo and Museum, you may stumble upon a large wine barrel. This is known as the Botte dei Canonici (the Big Barrel). It was built in the 15th century by the monks who lived in the rooms above where it is stored (Canonic Palace). The last time it was filled was in 1928. You can either admire it from the streets or enter to see it up close for free. Above the barrel is the Diocese Museum of Gubbio, displaying art from the eugubino district. To find out more about the museum, click here. Story has it that the church was built after Saint Francis’ death on the location of the Spadalonga family residence. When St. Francis fled from prosecution, he sought refuge with friends, the Spadalongas, who provided him hospitality. Next to the chapel are the remnants of a very old house, traditionally identified as the Spadalonga’s home. The church was built and being used as early as 1256, but the decoration of the interior was not completed until 1291. The octagonal bell tower was added in the 15th century. The church transformed once again as vaulted ceilings were added in the 18th century. The Wolf of Gubbio (aka Brother Lupo) is a great tail (sorry for the pun) about St. Francis and his time in Gubbio. When St. Francis was staying in Gubbio, there was a wolf terrorizing the town. He devoured animals and men alike. The townspeople were so frightened they refused to go beyond the walls of the town. St. Francis had great empathy for the citizens of his adopted home so he decided to go out in search of this feared wolf. A few people went with him, but stayed far behind because they weren’t foolish. When he found the wolf, it started running towards him, but St. Francis wasn’t afraid. He made the sign of the cross and started speaking calmly. The wolf immediately stopped his attacked and came to lay at Francis’ feet. The townspeople saw this from afar and were amazed. Francis and the wolf made a pact that if the wolf promised to stop terrorizing the town, the town would take care of him. The wolf followed at his side as they made their way back to town. In front of the all the town, they shook on the promise. For the next two years, before the wolf died of old age, the wolf walked freely among the homes and people fed him at their doorsteps. Across from the church, on the other side of the Piazza dei Quaranta Martiri, is the Logge dei Tiratori (or Spedal Grande). This long building was erected in 1326 and was home to St. Mary’s Hospital. During the 17th century, the Woolworker’s Guild was finally allowed to build stretching loggias above the hospital where they could stretch the damp pieces of cloth to the desired size and let dry. In the center of the Piazza is a monument to the fallen of the Great War. It was restored to its original glory in 2012. The church is mentioned in documents dating as far back as the 12th century. It’s simple style with arches supporting the roof became the model for other churches in Gubbio. The piazza has a line or olive trees and interesting lighting. This is also where you’ll find the public restrooms. Note: a lot of public restrooms in the Province of Perugia are not free so carry some change. Just outside the city walls is the Teatro Romano. Built during the 1st century B.C., it’s the second largest surviving Roman theatre in the world and is still used for performances today. You can purchase tokens to enter the theatre and roam around at your own leisure. If you plan on driving to Gubbio, there is a parking lot in front of the Roman Theatre. Photo Tip: Be sure to walk out into the field beyond the stadium for a photo of the outside of the Theatre with the town of Gubbio in the background. If you don’t feel like walking through the town (as a lot of if it up steep alleyways), there’s the option of taking the “dotto train.” You can take a tour through history on this city bus. The tour lasts 40 minutes and covers a 7 km route with 62 points of interest. The train is even equipped with headsets and an audiovisual system. You purchase tickets on board. Cost per adult is 8.00 €. The town main stops are Piazza Grande and Piazza 40 Martiri. The only thing I couldn’t figure out is when the tours start. I didn’t know about the train tours until we saw the train coming down a street as we ate gelato. I look up all the information later. The region of Umbria is known best for its truffles so order a dish with this prized ingredient. If you’re visiting in May, you can attend the Corsa dei Ceri Festival. The festival occurs on the eve of the Feast of Saint Ubaldo. The festival includes a race where citizens carry Ceri to the Basilica of Sant’Ubaldo. The “Ceri” are three tall, heavy wooden structures on top of which are placed the statues, respectively, of Sant’ Ubaldo, San Giorgio and Sant’Antonio Abate. The Ceri are attached to frames which the Ceri bearers (“ceraioli”) carry on their shoulders while running through the streets of the town and up to the Basilica of Sant’Ubaldo. The race begins in the Piazza Grande with the raising of the Ceri. The ceraioli race around the square 3 times before separating down the streets of the town, before meeting up once again for the Bishop’s blessing of the Ceri. Then the race begins to the Basilica. The race ends back at the Piazza Grande. Where is your favorite day trip in Italy? Share in the comments! Get the look! If you liked the Persol sunglasses my husband is wearing in our photos from this trip, check out the amazon link below. These glasses can also be seen in La La Land, worn by Ryan Gossling’s character. Please note that as an affiliate member, I’ll earn a small commission if you purchase through this link.